Decorate your home or event spaces with our fine art gallery wrap canvas prints. Delivered within 5 - 8 working days. Whatsapp Caleb Or Adeline at +65 85852052 or email weheardyou@touchstudios for any clarifications. 2. Bright white in colour – this is perfect for showcasing brilliant hues and sharp definition. 1. Our canvas has independent certification that it is archival for 100 years. Why should you get a Canvas Print? Some pictures and photographs are special. They deserve to be highlighted and made to last forever. These moments in life make ideal candidates for canvas prints. Imagine your wedding picture artistically rendered into a 42x63 inch portrait. Each sparkle in your eye captured in picture that will remain fresh for more than 75 years. Your child’s first smile. Your prize-winning photograph. Your favourite holiday snap. Your family portrait. Each of them can be brought to life for you to enjoy for a lifetime. For this very reason, Canvas Prints also make unparalleled gifts for the people in your life. What does Touch Canvas Prints Offer? At every step in the making of the Canvas Print, Brilliant Prints uses the best materials, processes and skills. We treat each picture as a candidate for a masterpiece. Our talented artists spend quality time preparing and processing your picture. This way you’ll get the perfect size and the exact colour-shades. Inks are perhaps the biggest differentiator between the product we create and the product manufactured by many of our competitors. As one of the greatest costs to a canvas printing business, inks are one area where many companies try to save money by using inferior, untested inks to create their canvas prints. Brilliant Prints is different in that we use only independently tested and certified inks that have been proven not to fade for between 75 and 200 years. Many canvas printers are using unsuitable printers and inks, some of which begin to change colour after only 12 months. Using Genuine inks can also offer a wider colour gamut (range of colours the printer can create). Our Epson Ultrachrome Inks are capable of producting a very wide spectrum of colours, hues and shades. These inks have been tested by the Wilhelm Institute, and are guaranteed to remain vibrant for at least 75 years. Incredibly smooth tonal transition between highlights and shadows. Completely neutral B&W prints (no colour cast throughout the print) Increased archival qualities - independently tested to last 200 years without fading Much denser blacks than prints created from colour printers The result really needs to be seen to be believed. We challenge any other canvas printer to create a B&W canvas print that looks better than those produced from our dedicated equipment. Each of our canvas prints are sprayed with two coats of a protective laminate. This is an essential step that ensures your canvas print lasts as long as possible. The process involves spraying a sealing layer of the protective coating over the entire print. The laminate we use is manufactured for us in Australia and is polyurethane based. Many canvas printers use cheaper, acrylic based laminates that tend to crack and peel. Our laminate also contains ultra-violet blockers which are microscopic metal particle that reflect harmful UV rays. In fact, the laminate alone is rated to protect the print for 75 years (on top of the inherant archival qualities of the ink). You will benefit from the antifungal components that are built into our laminate. These stop mould and mildew growing on your print, which is especially important in Singapore's tropical climate. Our laminate is also scratch resistant, water resistant and boosts the colour in your canvas print. We offer a choice of high gloss, matte, or satin. A canvas print without laminate is like a car without paint. It will deteriorate quickly and result in a print that looks terrible. The image below shows how tough the protective laminate we apply to our canvas print really is. The printed canvas samples have both been through a full cycle in a washing machine, with washing powder. The sample on the right was not laminated prior to conducting the experiment. The sample of the left had a coating of our laminate. Next, we use acid free, Australian made, framers tape to seal the join between the timber frame and the edge of the canvas. This protects against dust, and provides a visually pleasing finish. 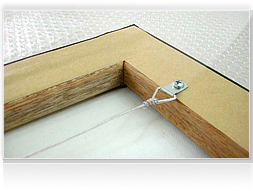 Finally, we insert professional grade hooks and plastic coated, stainless steel wire to allow you to hang your print. This means that your print is ready to hang straight from the box. We want you to be 100% happy with the product you receive from us. Thus, you can order your canvas print, and you do not have to pay a single cent until you have received the print. If, for any reason at all, you are not completely, absolutely 100% delighted with the way that your print turned out then simply contact us and we will arrange for our courier to collect the print from you and return it to us at no cost to you. This guarantee extends to imperfections in the canvas, you simply changing your mind, you deciding that you would prefer a different image, colour problems, framing problems, your recent divorce from the other person in the photo. Whatever the reason, we will do everything to ensure you are satisfied." We can offer this guarantee because we have created over 100,000 canvas prints for clients all over the world, and believe so strongly that our product is the best available in Singapore, and the world.